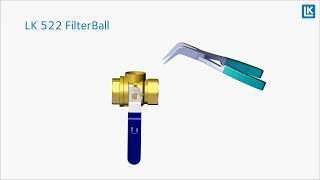 LK 522 FilterBall is a ball valve with an integrated filter suitable for heating, cooling and tap water systems. The filter is easy to clean, just close the ball valve, unscrew the lid and remove the filter. The valve requires no maintenance, but the installation should still be checked regularly.